Looking for some 600ESP component suggestions for your 600 ESP or other 600 size helicopters? Here are some of my recommendations, some from my 600 ESP customer's, along with other workable options; going over motors, ESC's, Servos, and Flight Batteries/RX powering options. Please understand, this is not an exhaustive list and there are certainly many other good options out there. Hopefully however, this list gives you an array of ideas based on budget and recommendations if you need some help deciding on components. I list the actual component specifications on the 600 ESP sales page, so that is the first place to look if you are not sure of the recommended minimum specifications you should be considering for your on-board components. So Many 600ESP Component Suggestions - How To Choose? Please understand, component selection in this hobby is not a black and white decision; there are endless shades of gray. Your choices will be based on your budget, your flying style, what voltages & other components you are running, and very likely personal experiences and preferences toward certain brands/models over others. There is no "best component brand" out there; if there was, we would all be using it and all the others would have gone out of business long ago. What electronic components you pair with your 600ESP (or any RC helicopter for that matter), will have the biggest overall impact on the finished flying cost of the helicopter. The cost of the heli kit can be nothing more than a drop in the pail if you pair it with top of the line components for instance. Just one example of this is servos. 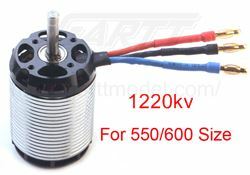 Standard size cyclic and tail servos for a 600 size heli can range in price from as low as $20 up to over $200 per servo! Most of the other on board electronics components can have similar price ranges. So will a servo or component that costs an order of magnitude more, perform ten times better, or last ten times longer? Highly unlikely... There is generally a diminishing return on performance the higher the cost (of pretty much anything, not just RC heli electronics). Most people who are interested in the 600ESP are not going to be putting ultra high end $200 dollar, BK or MKS HV brushless servos in it. That in my opinion is overkill for the type of performance a 6S powered 600 size helicopter is capable of. In addition to less flying stress; there is less crash stress transmitted back to the cyclic servos because the 600 ESP uses linkages and bell cranks which absorb a fair amount of blade impact energy from getting back to the 3 cyclic servos. The tail uses a flexible metal push-rod over a stiff carbon rod and that too helps absorb tail impact energy from reaching the tail servo. Of course, if money is no object, high voltage brushless Futaba, BK, or MKS servos are great pairings in my opinion if you can afford them. The great thing these days, is, electronics for the most part, are all pretty good so you don't have to spend a fortune for very workable components that most average people will be more than happy with. Moreover, lots of online help and reviews out there to help you decide on the lower cost stuff if you want to find out if prices are too good to be true or what's the catch. The following are just some of the component choices for the 600 ESP heli. I list them in order of cost from low to high under each section (Motor, ESC, Servos, LiPo Packs). I don't go over FBL systems because most people have their favorites already. You may see a J, C, or $ beside some components. These are just additional idications I thought might help a few people out. The red J means it's a component I've used or have experience with and recommend for this heli. *The green C is for customer's recommendations. The blue $ for pricey high end choices. I have links to many components if you want to read up on them or purchase. Lastly... If a link is not working to any of these components I have listed (they are always changing), just copy the product model description / number and paste it into your web browser to search for it. Most of these items you will find at various online hobby shops; and eBay almost always has everything! Motors for the 600 ESP as I stated on the sales page must be no wider than about 52mm to fit between the 54mm frame spacing. They must have two of the mounting holes spaced at 25mm on center. The shaft must be 6mm in diameter with the pinion set screw flat on the bottom half of the shaft. The shaft should be about 24mm long, so longer shaft motors will have to have the shaft cut shorter. Don't get a motor with a longer shaft if you don't know how to shorten it. Running 6S, the KV range should be between 1100 & 1250. The Setup & Tips ebook that comes with my 600 ESP's goes over calculating head speeds if you are not sure how to yet. Turnigy 550/600 Series 1220KV Heli ($40 USD) "C"
Gartt 550/600 Size 1220KV ($45 USD)"J" "C"
Turnigy T600 1100KV ($65 USD) "J" "C"
Rotorstar 550/600 Size 1250KV ($80 USD) "J" "C"
O.S. OMH-4535-1260KV ($140.00 USD) - Shaft Requires Shortening "J" "C"
KDE 550XF-SR28 1200KV 6mm XL Edition - Shaft Requires Shortening ($180 USD) "C"
Kontronik Pyro 600-12 1200KV ($300 USD) "$" "C"
The ESC (electronic speed control) for the 600ESP (assuming 6S) should be rated at no less than 100 Amps, 6S voltage, and have heli software (soft start, no break, etc.) I'm a huge fan of data logging ESC's for helis of this size, but it's not essential to have. To access most heli programming fields in ESC's, you need the programming card or USB doo-dad. Make sure you read up if the ESC comes with those items or if you have get them separate; most don't include them! Most ESC's don't have an adequate internal BEC to power the onboard electronics. I recommend at minimum 7 Amps for the 600ESP, but going higher won't hurt. There are a few ESC's that have internal BEC's that are rated that high, but most don't, so read the specifications carefully when choosing. If the ESC's BEC is rated too low, it's no big deal and you can still use the ESC, but you will need a separate powering method for the electronics. I like powering my electronics on all my larger helicopters with a dedicated RX battery pack, but a good external BEC works very well too. I go over all that in the setup & tips ebook you get with the heli. YEP/RotorStar 120A LV ($70 USD) "J"
HobbyWing Platinum 100A-V3 ($70 USD) "C"
Castle Creations Talon 90 ($75) "C"
Castle Creations Phoenix Edge LV 100A ($120 USD) "J" "C"
Castle Creations Talon 120 HV ($190 USD) "C"
Servos, where to begin! There are likely hundreds of standard size servos I could find that would work in the 600ESP and the suggestions below represent only the smallest smattering of what's out there. The two most important words to get out of that sentence is Standard Size. This heli takes standard size servos only. I have servo minimum speed and torque specs listed on the 600ESP sales page, so again, that is very much worth looking at. The 600ESP heli, like most electric powered RC helicopters with eCCPM requires 3 identical servos for the swashplate. These are usually called cyclic servos, and they should be digital, preferably with coreless or brushless motors. The tail servo must be a fast tail specific digital servo, again coreless or brushless. Some of the tail servos listed below are 760us narrow pulse width, so your FBL unit must support 760us tail servo programming to use them. If not, stick with the standard 1520us pulse width tail servos. I talk about coreless & brushless servos on my servo page in greater detail, but the short of it is brushless costs more but should last longer, coreless usually gives you best bang for the buck. I tried to ensure all cyclic servo's listed below have 25T Futaba servo spline sizing since my 600ESP kits come with Futaba/25T cyclic servo wheels, but it wouldn't hurt to double check. No big deal if servos have a different size spline of course, you'll just need to use different servo horns/arms/wheels with them. Lastly, look for "Servo Combo Packages" if/when possible. 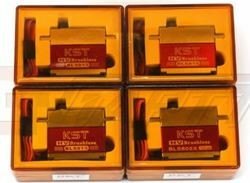 You can generally save a few bucks if you find a 3 pack of cyclic servos, or even the odd 4 pack of cyclics and tail such as the KST package set (a customer favorite) in the above photo. Alturn AHBS-2407TTG HV Brushless Digital 18 kg-cm 0.10sec/60 ($45 USD) "C"
Savox SH-1258TC Coreless Digital 12 kg-cm 0.08sec/60 ($60 USD) "J""C"
KST BLS815 HV Brushless Digital 20 kg-cm 0.07sec/60 ($70 USD) "C"
BK BLS-8001 HV Brushless Digital 26 kg-cm 0.12sec/60 ($160 USD) "$"
Alturn AHBS-1203HTG HV Brushless Digital. 11 kg-cm 0.048sec/60 ($45 USD) "C"
Savox SH-1290MG Corless Digital 1520us 5.0 kg.cm 0.05sec/60 ($65 USD) "J" "C"
KST BLS805X HV Brushless Digital 760us narrow. 5.5 kg.cm 0.048sec/60 ($70 USD) "C"
Align BL750H HV Brushless Digital 1520us 5.0 kg.cm 0.045sec/60 ($145 USD) "J"
BK BLS-8005 HV Brushless Digital 760us narrow. 5.0kg.cm 0.03sec/60 ($175 USD) "$"
MKS HBL880 HV Brushless Digital 760us narrow. 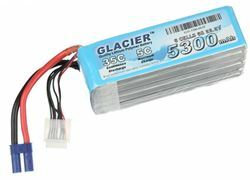 8.2 kg.cm 0.044sec/60 ($225 USD) "$"
The Glacier 35C 5300 mAh 6S LiPo Battery Pack Is One Of The Best Value Quality Packs On The Market For The 600ESP IMO. 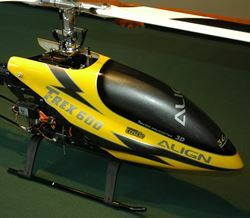 The 600 ESP Helicopter needs a 6S LiPo flight battery. It should be in the 5000 to 6000 mAh capacity range for correct center of gravity weight distribution. As I say on the 600ESP sales page, the minimum discharge C rating I would recommend is 30C. Size wise, nothing larger than about 150mm long, 55mm wide x 60mm deep give or take a few mm's. 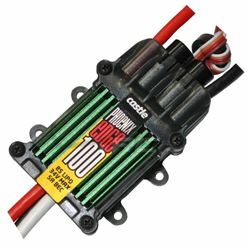 You may also want to see my RC LiPo Battery Connector page for more information on connector types for the 600 ESP, but XT90's or EC5's would both be okay choices. Much depends again on how you fly and how much maximum current you'll be pulling. Zippy Flightmax 6S 5000 mAh 40C ($60) "C"
Turnigy 6S 5000 mAh 40C ($75) "J" "C"
Glacier 6S 5300 mAh 35C ($105 USD) "J" "C"
Pulse Ultra 6S 5000 mAh 35C ($115 USD) "J" "C"
Yes, I know, canopies are not "components", however I get enough 600 ESP canopy option questions, I thought I better talk about them a bit. For those that don't care for the canopy that comes with these Phoenixtech 600ESP kits, or purchased a no-canopy kit and now want to get a canopy, there are a good number of options out there. To be perfectly frank, even though I sell these kits, I'm not a fan of the canopy that comes with them. They are certainly okay and better than most other aftermarket ones, but also not nearly as good as what Align offered. The paint quality is pretty decent, but limited to only the one paint scheme and the fiberglass is soft and thin. My main focus with these kits of course is for scale projects which makes a canopy unnecessary. If however you intend to fly in pod & boom format for a while before (or ever) putting a scale body over your 600ESP mechanics, and want some canopy options, here are a couple ideas. First off, any canopy that states it will fit the T-Rex 600ESP, should certainly fit these Phoenixtech 600ESP kits as well. I say "should" because I have been involved in this hobby long enough to know just because an aftermarket part says it fits, that is not always the case. Canopies however are rather flexible and very forgiving to a less than perfect fit. The first obvious option is the original Align 600ESP yellow canopy. 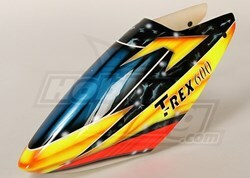 I still have one from my very first T-Rex 600ESP and it fits like a glove and looks just as good on the PT version. These Align canopies are no longer made, but they do surface from time to time on eBay (either used or in new condition). Price wise, generally in the $40 to $60 USD range (used). The few new ones I have seen pop up from time to time are fetching over $100 due to rarity. Hobby King also offers a few canopies that fit the 600ESP. Pictured here is one fairly "colorful" example. Price is in the $30 to $40 USD range. If you've purchased a 600ESP kit from me and need some component selection help, don't hesitate to ask! If you know of another/s 600ESP canopy or sources that work well, I would also love to hear what you found.